Tis the wind and nothing more” (Edgar Allan Poe “The Raven”). 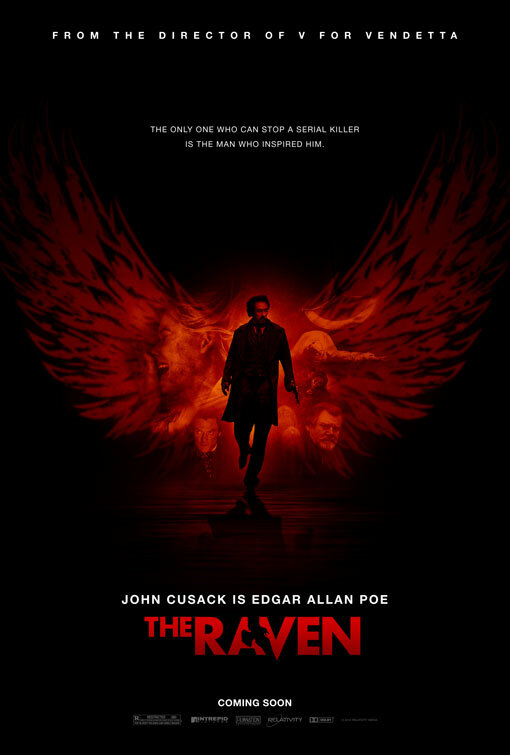 Edgar Allan Poe (John Cusack) comes back to Baltimore to find the town in a disarray as a result of a series of brutal murders. Detective Fields (Luke Evans), in charge of the murder investigations, notices that the murders resemble those in Poe’s stories. Detective Fields then “recruits” Poe to help him make sense of the strange happenings. However, it becomes apparent that Poe is in town for “business”: to ask the hand of his beloved Emily Hamilton (Alice Eve), the daughter of Captain Hamilton (Brendan Gleeson), a prominent town figure. However, when Emily becomes the subject of the murderer’s attention, Poe must use all his powers of imagination and play a deadly game devised by the murderer to save her. Essentially, the film tries to be a cross between ‘Sleepy Hollow’ (1999) and ‘From Hell’ (2001), but, in the end, fails to come even close to the depth or ingenuity of either of these two movies. In fact, ‘The Raven’ is far from being original in any way, save maybe for the introduction of Edgar Allan Poe to the screen. The idea that murders must be based on something, be it the Latin alphabet, ‘The Alphabet Killer’ (2008), or a story, is as old as time. Half-way through the movie, “The Raven” comes very close to imitating ‘Se7en’ (1995), and this is also very disappointing. Moreover, at some point in the film, the murders turn almost ‘Saw’ (2004)-like, but without giving the victims the possibility of an escape. ‘The Raven’, directed by James McTeigue, is a far cry from this director’s previous film ‘V for Vendetta’ (2005), and could even pass for some gruesome mediocre TV series, if not for a couple of stunning scenes and generally “above-the-average” acting. Also, if not for the sporadic scenes of horrifyingly gruesome violence, the film could have been marketed for a much younger audience, because of the movie’s simple, uncomplicated narrative, involving a murder mystery, and many “Zorro-type” rescues. Although many critics have termed the film “a stylish Gothic thriller”, the movie is far from being “stylish” per se, maybe save for the actors’ occasional choice of clothing. The logic of the plot is also doubtful at best. It is hardly believable that every police idea about the murders (the majority of which are very far-fetched) turns out to be true, with Detective Fields being equated with Sherlock Holmes. Another criticism is that ‘The Raven’ has little or no context, and no “parallel” stories, which may have given the audience the incentive to care about the main characters and their fate. More importantly, however, the film lacks any memorable moments, maybe apart from the ending, which, although touching, is actually also silly and unsatisfying. It is evident that the movie tries hard to impress, but by trying to be so many things at once: a thriller, a horror, a romantic drama and an action film, ‘The Raven’ fails to achieve the high standard it set for itself. With too much action and little thought, the film feels almost like a parody on something much grandeur. The speed of events in the film is so fast (the velocity of the narrative is astounding! ), the film becomes almost too weary to watch, and those people who pray for the ending to come should never be blamed for their justified impatience. On a more positive note, ‘The Raven‘ is entertaining and even enjoyable at times: there are nice turns and twists, and it has its share of funny moments. The film truly captures the spirit and eccentric personality of Edgar Allan Poe, and it is very curious to see John Cusack (‘The Runaway Jury’ (2003) and ‘Identity‘ (2003)) not playing a “modern” man for a change. Nice review, more fuel to the fire with regards to the fact that I should wait to watch the Raven when its available via streaming or on cable.